MacKenzie Commercial Real Estate Services, LLC is proud to announce they have been awarded the listing assignment for 72 Loveton Circle, in Sparks, Maryland, a Class A office building totaling 52,700 feet. The MacKenzie team of Bill Whitty, Matt Mueller, Meghan Roy, and Henson Ford will be representing the owner, Loveton/York Limited Partnership, in leasing or selling the asset. “Having worked with MacKenzie in many capacities over the past decade on Caves Valley Partners projects, I am confident in their ability to return this timeless building to being 100% leased, which it has been for over 20 years, or to position it as a premier purchase opportunity in the market,” stated Arsh Mirmiran, the family representative for Loveton/York Limited Partnership and a partner at Baltimore-based real estate development firm Caves Valley Partners. Situated in a prominent location on York Road at the entrance to the Loveton Business Center, 72 Loveton offers exceptional visibility and provides tenants and visitors easy access to abundant nearby amenities including retail, professional services, banking, lodging, dining and more. The building is easily accessible to I-83 via Shawan Road or Belfast Road, making it a convenient location for companies that draw employees from both Maryland and Pennsylvania. Planned renovations include cosmetic updates to the building’s two-story atrium lobby and its common areas. 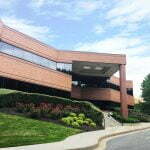 The building also has a recently replaced roof, HVAC systems, and beautiful, mature landscaping. For more information on 72 Loveton, please visit www.mackenziecommercial.com. For leasing inquiries contact Bill Whitty at bwhitty@mackenziecommercial.com or 410.494.4862, Matt Mueller at mmueller@mackenziecommercial.com or 410.494.6658, Meghan Roy at mroy@mackenziecommercial.com or 410.494.4846, or Henson Ford at hford@mackenziecommercial.com or 410.494.6657.